Low back pain and/or leg pain that usually travels down the large sciatic nerve, from the lower back down the back of each leg, is generally referred to as sciatica and is fairly common. This pain can be caused when a nerve root in the lower spine that helps form the sciatic nerve is pinched or irritated. Sciatica is usually caused by pressure on the sciatic nerve from a herniated disc (also referred to as a ruptured disc, pinched nerve, slipped disk, etc.) in the lumbar spine. 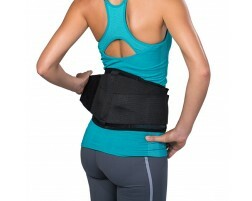 Wearing a back brace can help relieve pain caused by sciatica. If you need assistance selecting a brace, use our guided tool, Brace Advisor, for recommendations based on whether you are currently dealing with sciatica or are looking at preventing injury.